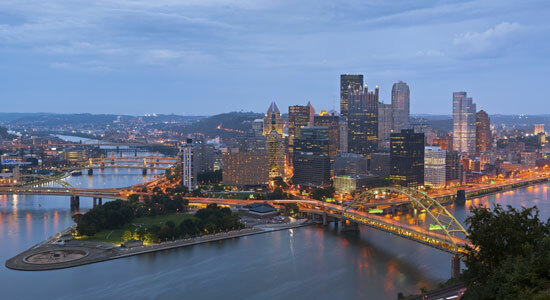 What separates Pittsburgh's skyline from so many other American cities? It's the abundance of bridges that pepper Pittsburgh's unique landscape. Nicknamed the City of Bridges, Pittsburgh hosts the most bridges of any city in the entire world – triple the number of former world leader, Venice, Italy. 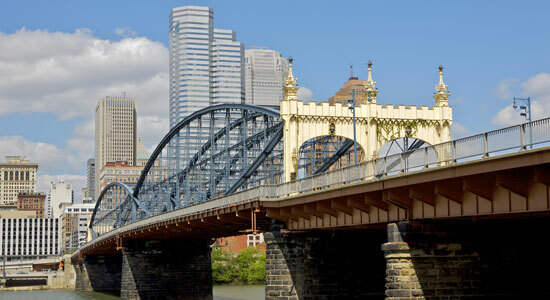 One of the hallmarks of Pittsburgh's landscape is the Smithfield Street Bridge spanning the length of the Monongahela River and connecting Smithfield Street downtown to Station Square. Built in 1881, it's considered the second oldest steel bridge in the United States. The current bridge is the third iteration of the Smithfield Street Bridge. A wooden bridge was built in 1818 to cross the Monongahela River but was destroyed in 1845 during Pittsburgh's great fire. A second bridge was constructed in its place, but it was deemed inadequate for traffic needs. Thus, the current Smithfield Street Bridge was erected. It was declared a National Historic Landmark in 1974 and continued to serve streetcar traffic until the mid-1980s. In the early 1990s, officials considered tearing down the bridge due to its low river clearance and deterioration over the years. 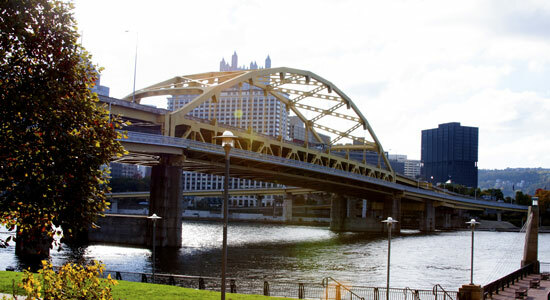 However, through community support and lobbying, the bridge received necessary updates in 1994-1995, as well as the customary Pittsburgh black and gold color scheme. If you've ever seen an aerial photograph of Pittsburgh, then you might've noticed three nearly identical bridges connecting downtown to the North Shore across the Allegheny River. 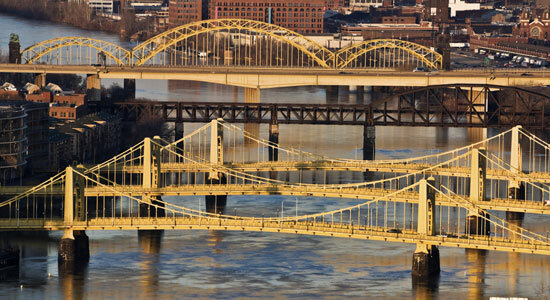 The Roberto Clemente Bridge, the Andy Warhol Bridge, and the Rachel Carson Bridge, are the only trio of identical bridges in the United States. They were formally named the Sixth, Seventh, and Ninth Street bridges, respectively. Built between 1926 and 1928, these three bridges featured one of the United States' first forays into self-anchored suspension. The only other known self-anchored suspension bridge was the Deutz Suspension Bridge over the Rhine river in Cologne, Germany. The three bridges were named accordingly for three unique and influential Pittsburghers. Roberto Clemente – who almost needs no introduction – was an historic member of the Pittsburgh Pirates and his bridge sits closest to PNC Park. Andy Warhol was an influential, groundbreaking pioneer in Pop Art who was born and raised in Pittsburgh. Rachel Carson, a naturalist from the Pittsburgh area, was a best-selling author and an early activist in environmental conservation. The New York Times once said that Pittsburgh was "the only city with an entrance." They could only have been talking about the Fort Pitt Bridge. Traveling through the Fort Pitt Tunnels presents you with an amazing view of Pittsburgh by way of the Fort Pitt Bridge. Built in 1959, the Fort Pitt Bridge spans the Monongahela River, and it was a replacement for the second Point Bridge that stood from 1927 to 1959. It's the world's first computer designed bowstring arch bridge and connects I-376 to downtown. We featured the Fort Pitt Bridge as one of Pittsburgh's craziest roads, because motorists must make lane changes across 4 lanes in the matter of 300 feet, depending on their route. It's certainly a challenge, and it doesn't leave much time to enjoy the incredible view of Pittsburgh. Known locally to many as "the Bridge to Nowhere," the Fort Duquesne Bridge stood unfinished for a number of years after PennDOT was unable to secure the rights of way for the north side onramps. Construction was first completed in 1963, but lacked any onramps from the North Side. It wasn't completely finished until 1969 when the ramps were finally added. In December of 1964, a Pitt student drove his station wagon off the end of the unfinished Fort Duquesne Bridge and was miraculously unhurt. His aerial adventure – along with public response – prompted the city to block the end of the bridge with concrete barriers until it was ultimately completed. Pittsburgh certainly has charm and character. There's no other city quite like it. Between its crazy roads and multitude of bridges, it can get a little frustrating for the uninitiated motorist. No matter how prepared you are, sometimes accidents still happen. If you're ever injured in an auto accident or car crash, contact our law firm for a free consultation. We're available any time.